In an exclusive look at her new book, Read My Pins, Madeleine Albright shares with The Daily Beast her favorite pins and the remarkable stories they bring to mind. 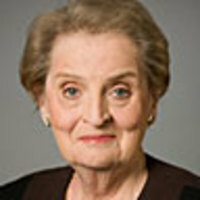 Madeleine K. Albright is a principal of The Albright Group LLC, a global strategy firm, and chairwoman and principal of Albright Capital Management LLC, an investment advisory firm focused on emerging markets. In 1997, she was named the first woman secretary of State. From 1993 to 1997, Dr. Albright served as the U.S. permanent representative to the U.N. Her latest book is Memo to the President Elect: How We Can Restore America's Reputation and Leadership.